Will There Finally Be a Chance to Invest in SpaceX Stock in 2016? Subject: Will There Finally Be a Chance to Invest in SpaceX Stock in 2016? + 9 = eighteen Required Please enter the correct value. Updated April 28, 2016: Many investors are eager to invest in SpaceX stock. We certainly are. Meanwhile, U.S. aerospace and defense companies are booming. In 2014 — the latest available data — these companies generated $408.5 billion in revenue, a 2% rise over the previous year, while earnings grew 9.8%, according to a June 2015 Deloitte study. SpaceX was founded in 2002 by Tesla Motors Inc. (Nasdaq: TSLA) Chief Executive Officer Elon Musk. Its mission was to reduce launch and transportation costs and to ultimately enable the colonization of other planets. Indeed, SpaceX brazenly announced that it’s planning to touch down on Mars “as soon as 2018, details to come” via its Twitter page on April 27, 2016. "NASA ended the shuttle program in 2011. That left the U.S. hitching rides to the Space Station from our 'good friends' the Russians," Money Morning Defense & Tech Specialist Michael A. Robinson, a 34-year Silicon Valley veteran and one of the top tech financial analysts today, said in 2012. "That's not good for national security, much less for innovation and exploration. When it comes to space transportation, thankfully, SpaceX plans to pick up where cash-strapped NASA left off." But SpaceX is privately held. Musk has said he has no plans to take SpaceX public right now. The last comment he made was in 2013 when he said an IPO is "only possible in the very long term when Mars Colonial Transporter is flying regularly." The Mars Colonial Transporter is part of Musk's spaceflight system that can take humans to and from Mars. In 2011, Musk said he hopes to be able to do this "within 10 to 20 years." It's a letdown for would-be investors. The good news is that we've found the best way to profit from the progress that companies like SpaceX have made. In fact, this investment's potential is directly tied to SpaceX's innovations. On the night of Dec. 21, 2015, SpaceX accomplished a historic landing. Ten minutes after its Falcon 9 rocket launched to carry 11 satellites into space, the rocket's booster touched back down safely in a vertical, pinpoint landing in Cape Canaveral. The successful return of a first-stage booster back to earth is the first in history by any orbit-capable rocket. With recoverable, reusable boosters, Musk has said he hopes to improve the cost and reliability of access to space by a factor of ten. SpaceX was the first company hired by NASA to carry supplies to the International Space Station (ISS), and it became the first private company to successfully do so, back in 2012. As of May 2015, SpaceX had already accomplished six cargo resupply missions to the ISS. The company has booked nearly 50 launches through 2017, including commercial satellite launches as well as NASA missions. These are expected to bring in roughly $5 billion in sales. Musk has an excellent track record for scoring massive contracts with NASA. For instance, in 2012, the agency awarded SpaceX $440 million to design and develop vehicles that can transport astronauts within five years. Specifically, NASA wanted SpaceX to further develop its Dragon V2 manned spacecraft. In May 2015, Musk showed off SpaceX's progress on the "fire-breathing" Dragon V2. He rolled out the 15-foot tall vehicle in front of an aerospace industry crowd. The Dragon V2 is capable of ferrying up to seven passengers and four tons of cargo to and from the orbital ISS. It can travel up to 10 missions before it requires refurbishing – a key to cost-efficient space travel. Musk says his company will be able to transport astronauts to the ISS for roughly $20 million per round-trip seat. That's more than $50 million in savings per seat compared to what NASA presently pays Russia to taxi astronauts to and from the ISS on Russia's Soyuz vehicles. Manned tests of the Dragon V2 are expected to take place in the next two to three years. NASA liked what it saw. In September 2014, it awarded SpaceX $2.6 billion to partner with another company for work on the agency's Commercial Crew program. Under the contract, the two companies must develop a cost-effective means to carry out launches and transport astronauts headed to and from the ISS by 2017. 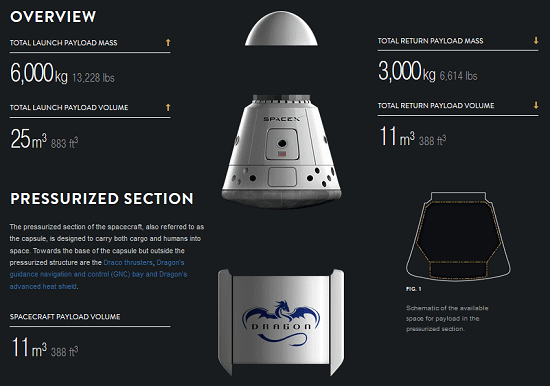 SpaceX is to complete its work on the Dragon V2 and transport up to six crewed missions to the space station. "Musk seems to think there's almost no problem we can't overcome. I agree with him," Robinson said. Musk has invested $100 million of his own money into SpaceX, plus it has venture backing. SpaceX has more than 4,000 employees at its Hawthorne, Calif., headquarters, and is consistently cash-flow positive. On Jan. 21, 2015, The Wall Street Journal valued SpaceX at $12 billion. And even though Musk has been silent on the topic, Robinson thinks eventually we will be able to invest in SpaceX stock. "He hasn't yet announced plans to take SpaceX public, but I believe that's what he'll do. I base that on what happened with Tesla." Even though you can't buy SpaceX stock quite yet, the commercial space sector is ripe with opportunity. That's why we found one of the best space stocks to buy today.